Here are someÂ tricks for night travel by motorcycle. If you missed the preset schedule, or deliberately arranged to move at night, you always need to have memorized a few tips to keep safe for all members of the delegation. Each destination with the same street, different terrain, so you need to anticipate these situations happen involuntarily. The first thing that needs to carefully schedule, number of crew members, and learn the same street, terrain to avoid getting lost while traveling at night. Supply lines should be easy to go up and make sure not too steep, deserted, narrow and dangerous road, subsidence, with many drives elephants, potholes. Do not set too many offensive group control, ensure discipline and safety for all members. Head of the delegation must have more experience, understand the schedule, route and control capabilities, led the delegation. Need reflective stickers for cars and prepare the necessary materials when moving in the night. Before departure to check the car and bring repair tools compact. White glasses, goggles are essential workers from rain, dust, dew and insects appear on the road, especially when they are attracted by the lights from your car. In addition, the utensils necessary to travel on the road for anyone’s first aid kit, multifunction knife, raincoats, gloves, masks, boots, towels, personal papers, toiletries personal and suitable clothing. Book the night before or carrying enough tents, avoid sleeping on the streets is very dangerous to passing vehicles. Mountain forest daytime fascinated with majestic beauty, but that night the scene is totally different, giving you the opposite emotion. Before your eyes is abysmal road under floodlights only 3-5 m. The two sides was a quiet black. Behind the abysmal road with sound of wind, sometimes known frog and language Ã¬ OAP motorcycle engines in the night. You might be a little nervous and scared. However, let’s fast static shock, concentration to handle situations and control the situation. When phÆ°á»£t evening, need for vehicle stickers reflective stickers and unified way for members to easily identify each other. Go with a maximum speed of 30km / h, not speeding, dangerous overtaking, zigzagging. Always wait for the other members and with the speed control, liaise between the car together. Each curve, downhill, slow down, in number, according to the slope, steady throttle, hand brake. No automatic lag after closing, spontaneous breaking of supply or separated groups without notice. At the mountain slopes, do not go to the edge of the road at the foot of the mountain, avoid slippery by clinging moss. Herbs and stones can also cause the steering wheel deflection and fell away. When preparing crab, turn up the lights please entitled to the car after the group can follow and not disoriented. When you need to stop, to turn on your computer and apply label on the curb. Ramp foggy, rocky hinder visibility, road under construction, should go with speeds below 20km / h to ensure timely handling situations. Keep longer distances with the car running ahead. If the mountain road, you need to toggle projector headlamps to close if other cars and in front. Although you’ve seen the way, and memorized details about that land, but at night easily disoriented. Now, map, compass, signposts on the road and look up their phone’s GPS will take effect. If trouble should signal the other person, you would need a flashlight, lighters, matchboxes. Moving in the night to the concentration should be to avoid fatigue, a little food and drinking water will be needed to energize the body, taking decisions, wiser judgment. The most important thing is to listen to the health of ourselves. If you are tired, not sober, should be moved to the driver’s companion to stay safe, have fun during the trip. 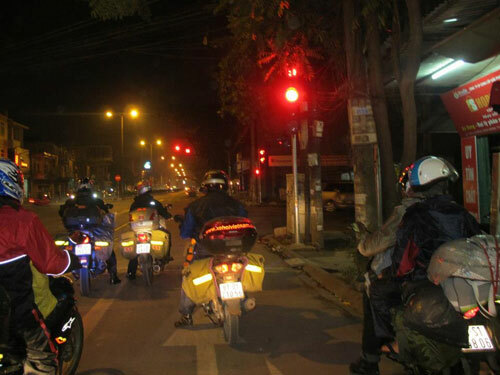 Hopefully, someÂ tricks for night travel by motorcycle will help you have a safe journey.